The illegal immigration problem has been a prime issue the conservatives rail against. The conservative movement has used this issue to ignite a wave of hate against the hispanic community and instill fear in the america public. They are proponents of spending hundreds of millions of dollars to build higher and longer walls and increase the number of agents on the US-Mexico border. 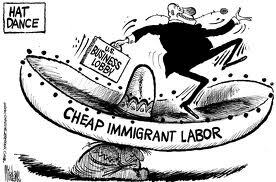 The conservatives are also proponents of maintaining the status quo when it comes to the companies and corporations that hire these illegal immigrants. · $3,000 to $10,000 for each individual if the employer was subject to more than one cease and desist order. The employer could also be fined $100 to $1,000 for each individual “paperwork” violation. The criminal penalties for a pattern and practice violation can be up to $3,000 for each unauthorized alien, imprisonment up to six months, or both. A new study by Rajeev Goyle and David A. Jaeger for the Center for American Progress in Washington calculates the cost of mass deportation to be at least $206 billion over five years. The annual cost of $41 billion would exceed the entire budget of the Department of Homeland Security ($34.2 billion) and would be more than double the annual spending on border and transportation security ($19.3 billion). The only way to stem the tide of illegal immigration is to make the penalties to employers so repugnant that they will go to great lengths to make sure they are hiring properly documented workers. If there are no jobs available for illegal immigrants than they won’t have a reason to cross the border. This would also have the added benefit of creating jobs for US Citizens and increasing tax revenue and lowering the deficit. The problem is, you won’t see a conservative touting a measure that would actually stem the tide of illegal workers. It would cut into the profits of the companies and corporations that support them. They would rather just hurl hate and lies and make you fear a minority rather than solve the problem they rail against. I like where you are going wtih this, but you missed something. Do you agree that we must eliminate *all* incentives if we want to stop the illegal immigration flood without wasting resources (walls, gaurds) protecting our border? 5. My children, newly minted citizens, will get free college (if they have half a brain and merly decent grades) based on ‘diversity’ scholarships. Why work? This, in and of itself, is a huge lifestyle improvement, a huge upgrade. The US needs to address the freebies, in addition to penalizing employers for hiring non-citizens. But human nature being what it is, no one wants to cut freebies because they are afraid of political backlash. Its tough to make the right call if one wants to be a career politician. So I’d encourage you to keep writing, keep thinking. You are on the right track, but broaden your scope. Agreed, ultimately the focus should not be on building walls and maintaining a fortress. We have to remove all incentives. We have to address the freebies, too. Or they will keep coming. They would be stupid not to.